Shakespeare wrote that “all the world’s a stage,” but the performances of his own plays were limited to a handful of venues. Before the construction of the iconic Globe theater in 1599, a couple of his works were put on at the Curtain in the Shoreditch neighborhood of London. 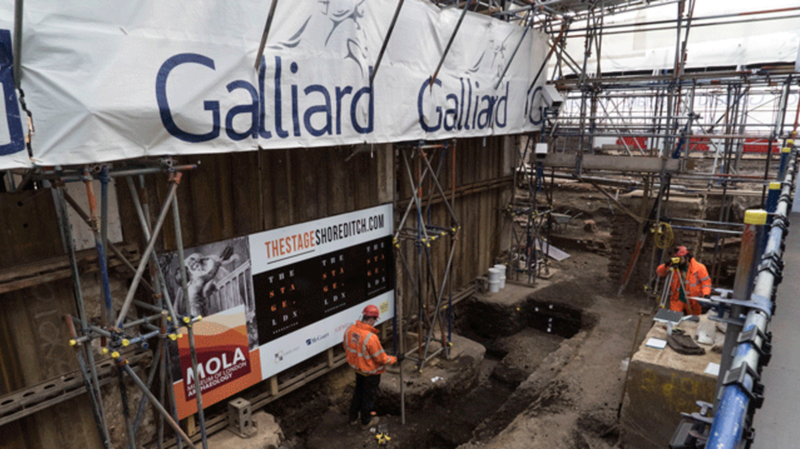 All that’s left of the structure today are foundations that have laid buried for centuries. Thanks to recent archaeological findings, experts now have a better sense of what the building looked like and how it may have influenced the writing of plays like Henry V.
As Smithsonian.com reports, the remains of the Curtain were rediscovered in 2011. Since then, archaeologists from the Museum of London Archaeology have made some surprising revelations, notably that the stage was long and rectangular rather than circular like the Globe. The stage directions of Henry V, which debuted at the Curtain in the late 16th century, describe the venue as a "wooden O." That line had long led scholars to believe that the theater was round. This recent finding, however, suggests that a change was made to the text after Shakespeare moved to the Globe. Questions about how character interactions may have been written to suit the venue, while fun, are highly speculative. But the idea that Shakespeare wrote Henry V with the Curtain in mind isn’t too farfetched—scholars believe he did the same thing for the Globe. The theater's large standing room section meant that lengthy plays were more likely to encourage the audience to "hiss and pelt the unfortunate actors with oranges," according to the University of Nottingham [PDF]. This may be why one version (the Q1) of Hamlet is lighter on soliloquies and features no intervals or breaks in the action. The Globe was also open-air, so performances could only last as long as the sun was out.